Hydrozincite forms in the oxidation zones of zinc deposits as masses or crusts. Crystals are rare, but can be found. 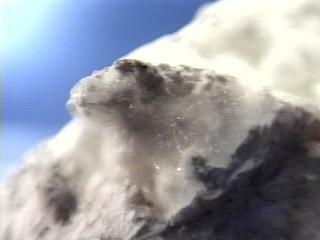 Hydrozincite may be present on many specimens, but is usually unnoticed or assumed to be some other more common mineral, such as calcite or aragonite. Color is white or clear, some tinted pale colors possible. Luster is vitreous or pearly to dull or earthy in massive specimens. Crystal Habits include massive forms that can be layered, stalactitic, concretionary, fibrous, and encrusting. Crystal are rare, but when found are usually thin, bladed and tapering to a point or in radiating tufts of acicular crystals. Fracture is uneven or fibrous. Associated Minerals include sphalerite, limonite, smithsonite, hemimorphite and calcite. Other Characteristics: is fluorescent (blue) in UV light and effervesceses easily in cold dilute hydrochloric acid. Notable Occurrences include Iran; England; Austria; Mexico; southwestern USA, and Australia. Best Field Indicators are fluorescense (blue), crystal habits, single plane of cleavage, localities, and reaction to acid.